This beautiful casual dining table and chair set will add a sophisticated touch to your contemporary home. 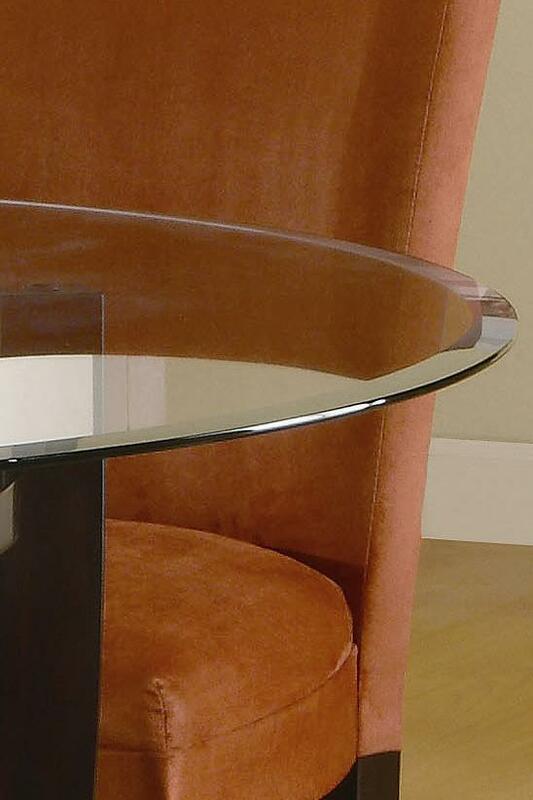 The sleek round ten millimeter thick beveled glass top is elegant, above a unique crossing wooden base. A dark Cappuccino finish creates a bold look that will complement your decor. The parson style chairs have high sleek curved chair backs and plush padded seats, covered in a soft and durable microfiber fabric. Chocolate, Gold Ochre, Terracotta, Taupe, and Light Green upholstery sits above square tapered legs in a rich dark Cappuccino finish. Choose your favorite fabric, or create a colorful mix. 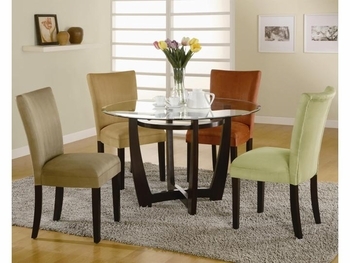 Add this beautiful dining set to your home for a style that everyone will enjoy.